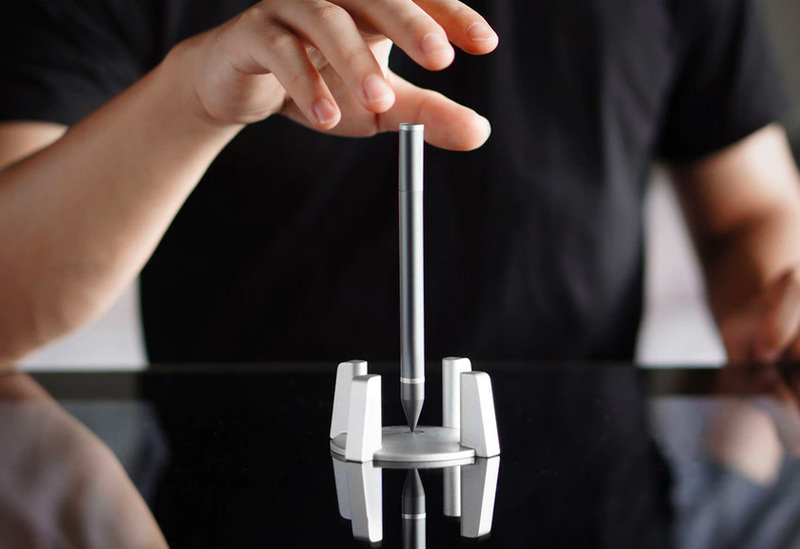 The Hoverpen is the world’s first vertically standing, gravity-defying pen. It stands in an innovative pedestal that creates a magnetic field to keep it perfectly balanced and will surely make it the most interesting item on your desk. Bonus: it writes, too, using refillable Cross pen ink cartridges. Choose matte or shiny aluminum finish. A funded Kickstarter. 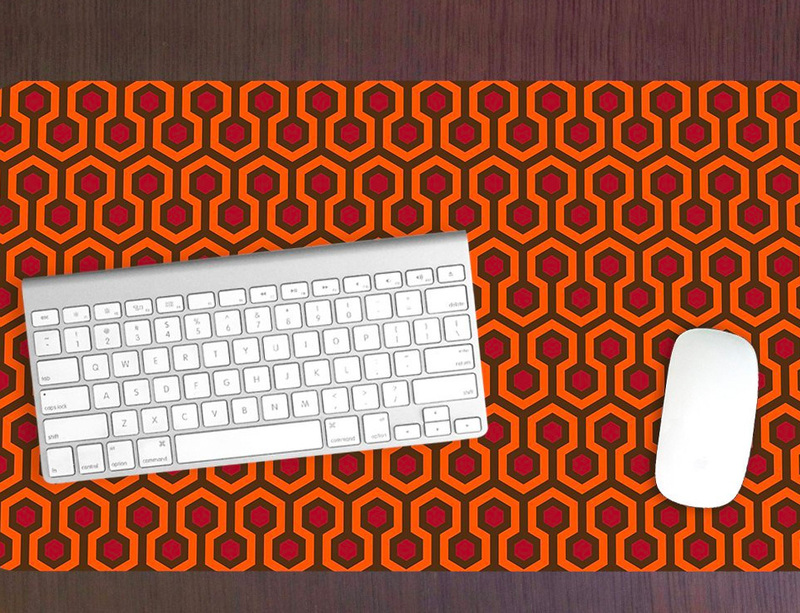 We know that “all work and no play makes Jack a dull boy” but we’re also pretty sure that this desk mat printed with the Overlook Hotel carpet pattern will brighten up your workspace. It’s made of a hand-washable fabric with a no-slip rubber backing & the sublimated digital print won’t fade. Handmade. Available in 2 sizes: 10″ x 16″ & 12″ x 22”. 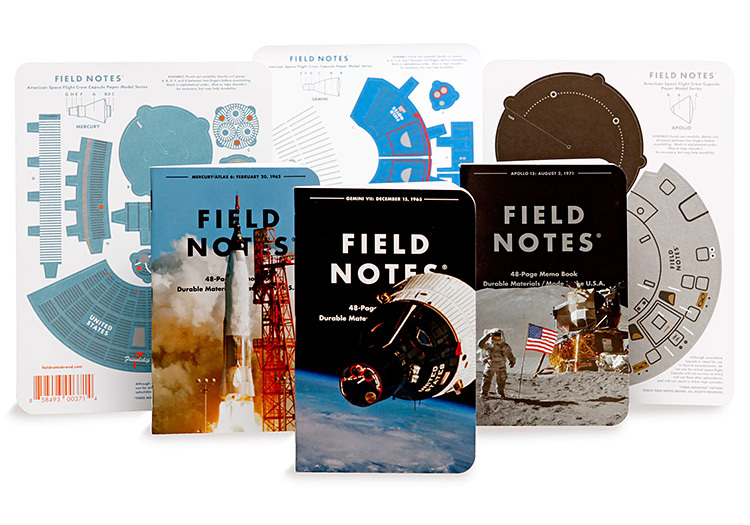 Designed & created by cult graphic guru Aaron Draplin, Field Notes’ pocket-sized memo books are constantly coming out in new & novel limited editions. The latest, 3 Missions Collection feature dramatic photographs from NASA’s Mercury, Gemini, & Apollo programs and are full of facts & figures. The 3-pack set also contains three “Punch-Out and Assemble” Mission-Specific Crew Capsule Models. Get ’em before they takeoff. 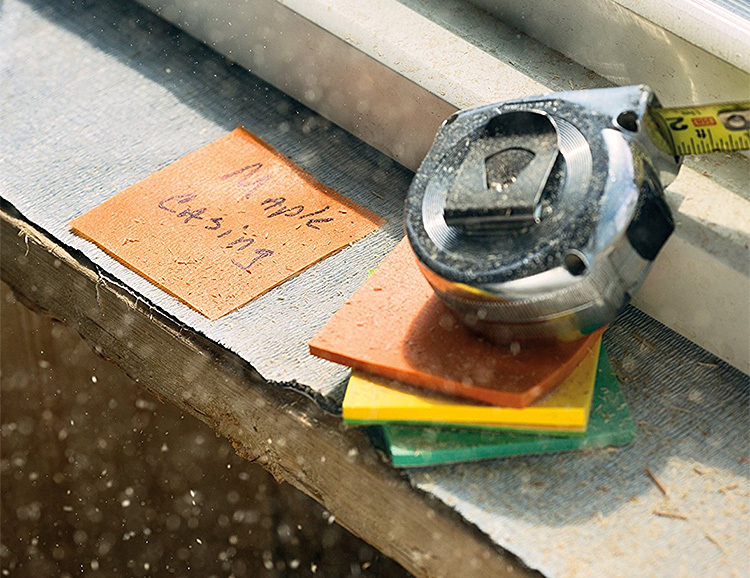 As the name would suggest, Post-It Extreme Notes are not your run-of-the-mill sticky notes. They’re made with ultra-strong dura-hold paper and adhesive to be water-resistant, durable, and writable. For indoor or outdoor use, they stick to textured and difficult surfaces in hot or cold environments. 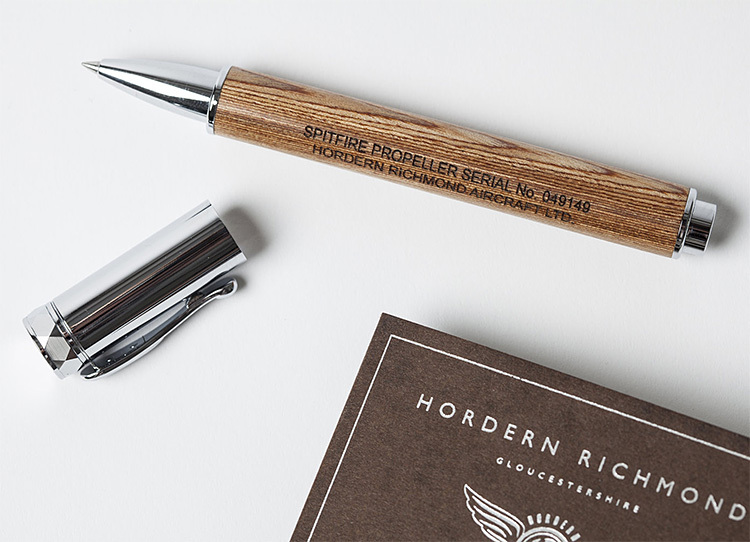 Made from the propeller of an original Spitfire—the infamous WWII fighter plane—this pen pays homage to aviation history with its Hydulignum construction, a high strength birch laminate seasoned by years of wartime use. The pen is also engraved with the serial number of the original propeller and comes in a handcrafted ash wood presentation box. 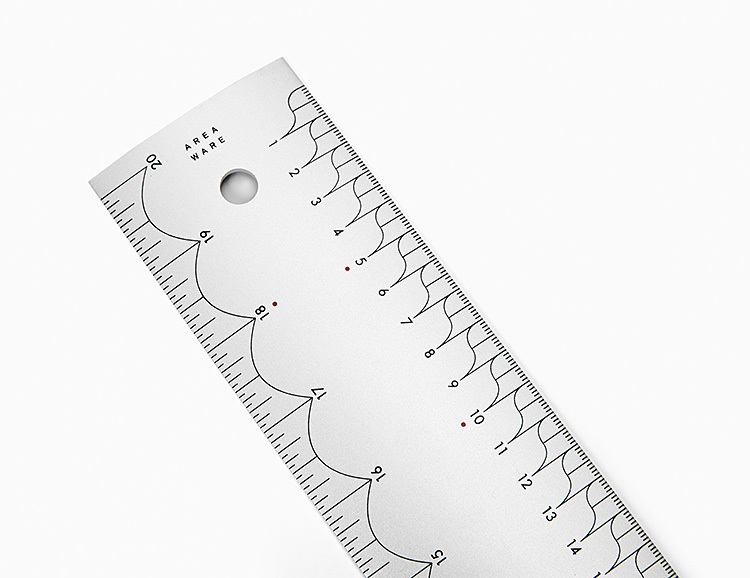 Area Ware is a design collective focused on the brutally functional and visually unique.Their Aluminum Ruler is a perfect example of the aesthetic, craft and creativity of their simple creations. The design uses visual hierarchies of color and shape to articulate the process of measurement: black lines callout whole and half numbers & large integers are marked with a red dot emphasizing their importance. Curves unify all the parts that make up a whole number. It features units of measurement in both inches and centimeters. 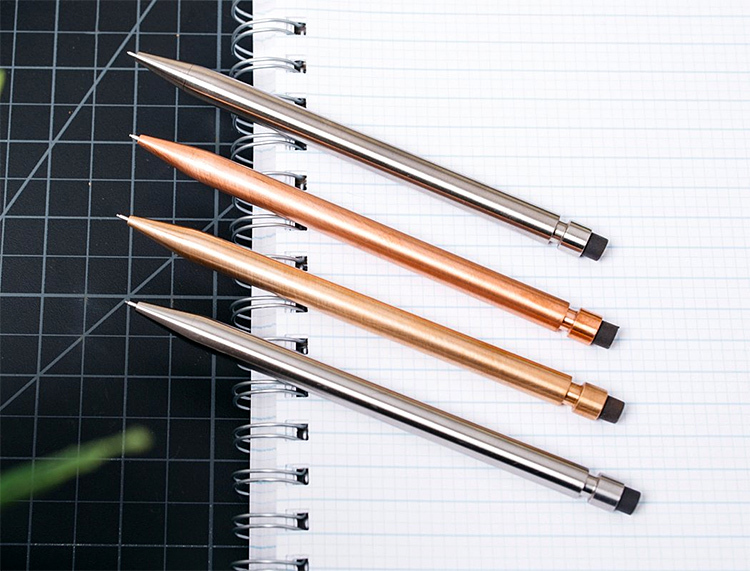 The Modern Fuel Pencil 2.0 is designed to be the ultimate writing implement for serious pencil people. It features a solid metal interchangeable mechanism and the ability to swap your lead size to fit any project. Available in titanium, stainless steel, copper, and bronze. Made in the U.S.A. 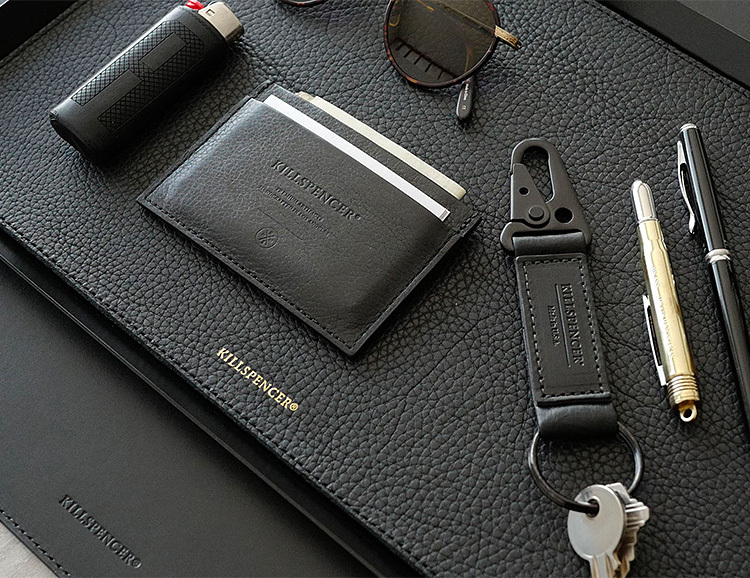 The Office Collection from Killspencer is a range of luxury leather goods designed to transform your workspace into a minimalist, mess-free station that includes a valet tray, desk mat, mouse pad, pencil case, paperweight, and more, all constructed of rich, full-grain Cognac or Black Bullhide leather. 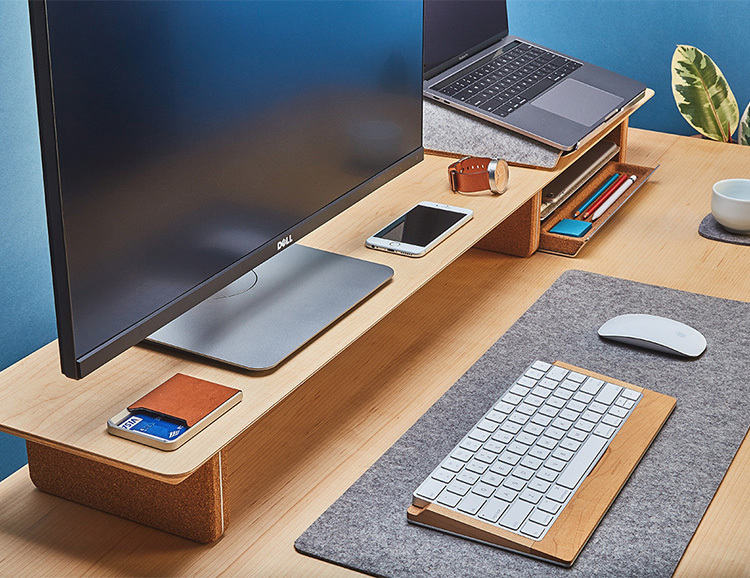 By creating a space for everything, the Grovemade Desk Shelf system is designed for effortless organization, allowing rapid, seamless transitions between digital and analog devices. Keyboard, pencil, mouse, notebook, phone. Whatever instrument you reach for, this simple suite of desktop essentials has your needs in mind. 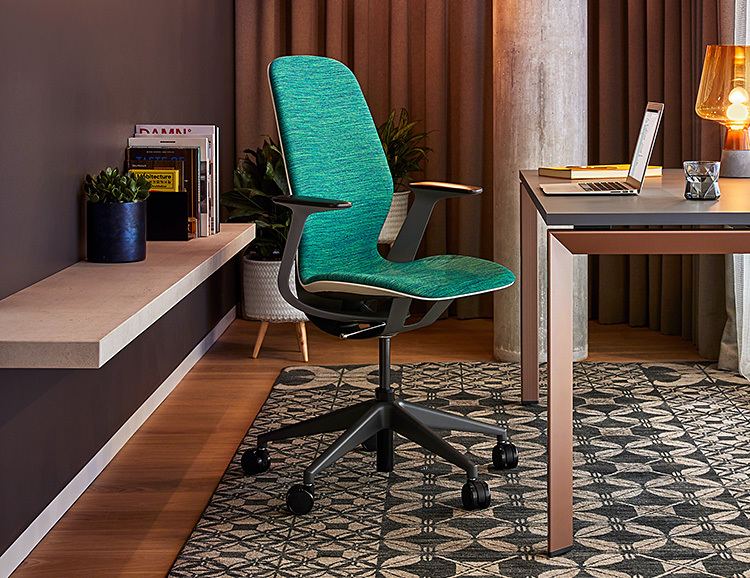 It includes a walnut shelf for your display, a wool felt pad for your keyboard & mouse, a collapsible laptop lift, and a desk tray for small accessories. 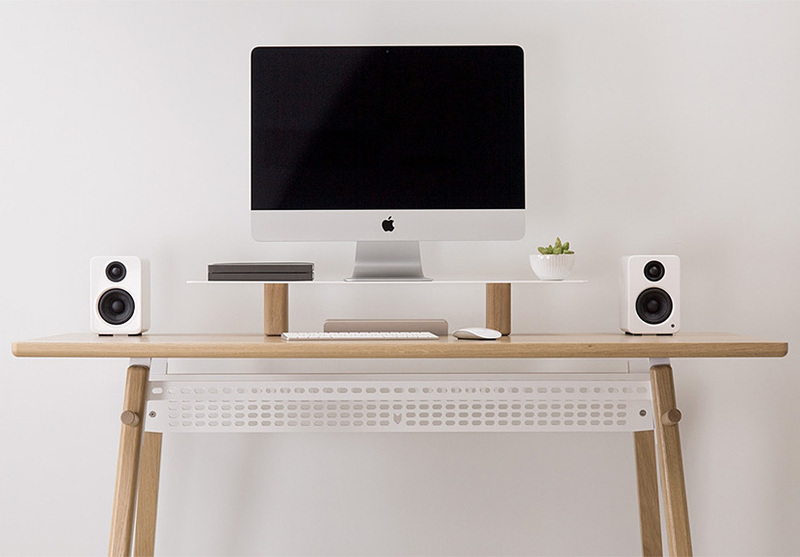 The latest American-Made design from Artifox is the sleek & minimalist Standing Desk 02. Made of solid hardwood, it measures L 52″ x W 26″ X H 42” and features a built-in dock, cable grid, and headphone hook. There’s also an optional stand for your iMac or desktop display. Available in a variety of wood finishes. With its rifle-like bolt action mechanism, this premium slider pen gets its sharp looks from the combination of stainless & Damascus steel construction. The Damascus steel process makes all the natural patterns & striations in the steel, making each pen one-of-a-kind. The pen comes loaded with a black Schmidt Easy Flow 9000 medium point and fits all Parker style ink cartridges. 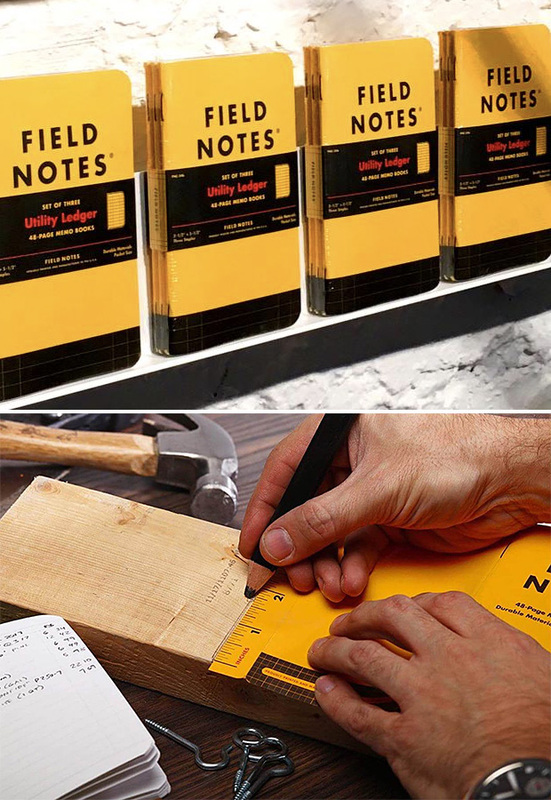 The Field Notes team releases new editions of their handy little notebooks 4 times a year. For Spring, they’re introducing the Utility series, available with Engineer Graph or Ledger paper pages. The cover stock is Safety Yellow Mohawk Via Vellum with a fold away ruler on the back cover. Available in 3-packs. The tactile feel of sketching on paper is lost when it’s transferred to the stylus-on-tablet mode. 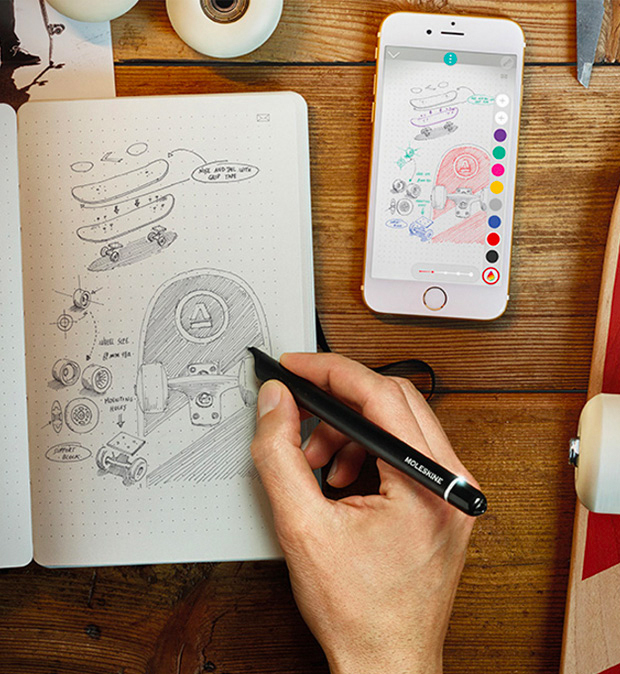 Moleskine’s new Smart Writing Set solves this problem. The set includes a special Moleskine notebook, an iOS App & a Bluetooth pen that instantly transfers the work you do on paper directly to your mobile device. With designs based on various terrain types: hill, waterfall, valley, & volcano, Danzo Studios’ Landscape series desktop organizers will clean up your workspace & store all sorts of devices & detritus. 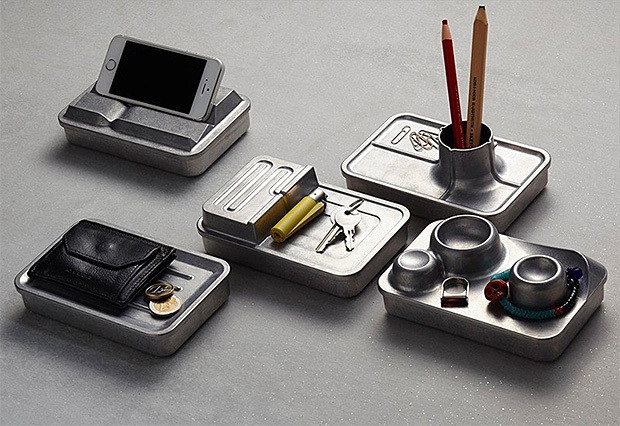 They’re small cases made of aluminum with storage underneath. 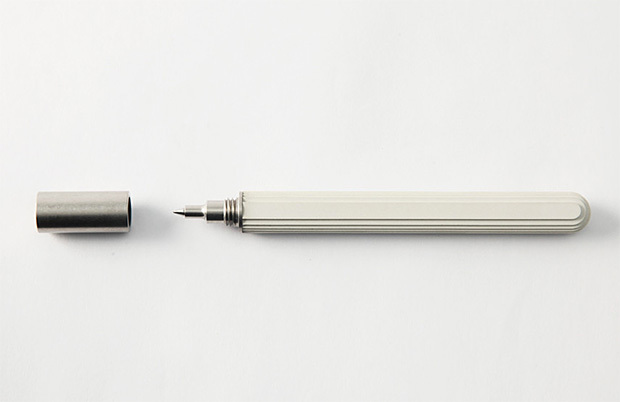 Created for Internoitaliano by artist and designer Giulio Iacchetti, the Neri Pen & mechanical pencil are 2 unique, premium-quality writing implements. 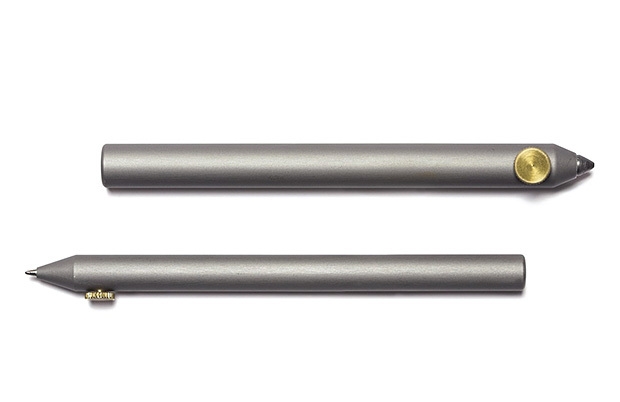 Made of lathed aluminum, both are refillable and feature a thumbscrew mechanism for adjusting the lead length of your 5.5 X 80mm graphite or changing your Mini ball D1 ink cartridge. This isn’t a balance toy like the Bongo-board or Vew-Do board. 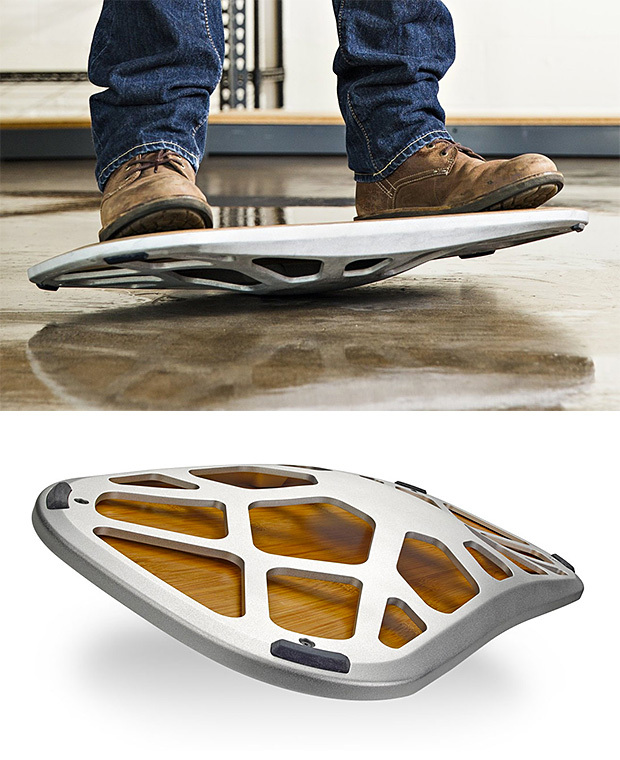 The Level was designed to create subtle instability beneath your feet & promote body movement giving users all the health benefits of continuous movement and muscle stimulation that balancing yourself provides. Use it at your standing desk, under your regular desk, while you sit on the couch, whatever, wherever. 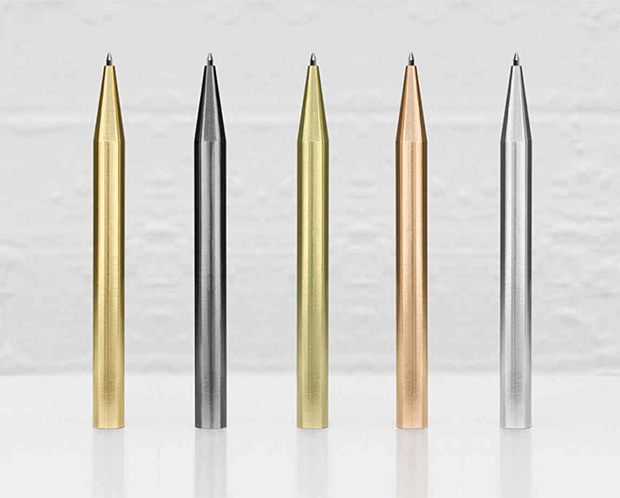 Minimalux pens are milled from a single block of raw brass and also come in a variety of colors inspired by rare elements: gold, rose gold, silver or black rhodium. The clean, minimalist design is backed by smooth, free-flowing Parker ink refills. Taipei-based 22 Studio specializes in the creative application of concrete and steel. 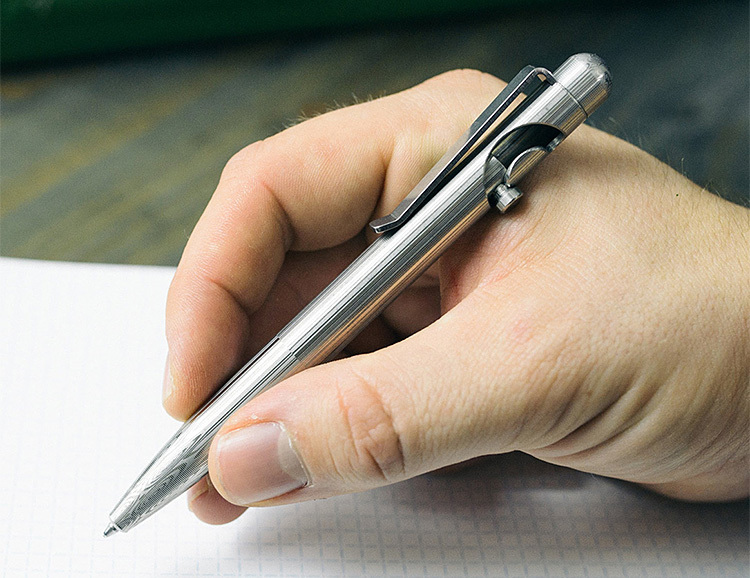 The Contour Rollerball Pen is a unique, high-quality writing utensil constructed of high-density concrete and stainless steel.